Heinz Nurture Starter Infant Formula is a whey dominant infant formula with iron, and is designed for term infants from birth. 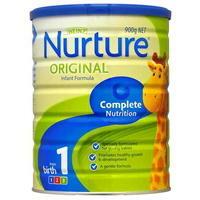 Heinz Nurture Starter Infant Formula contains added nucleotides that are naturally present in breastmilk. Nucleotides play a role in development and maturation of baby's gut and immune system.